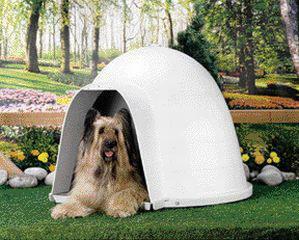 Dog Igloo houses are some of the most popular dog housing types for a number of good reasons. You will love the convenience and well-being it brings to your dog! Let's take a look at what makes dog igloo houses so special. The round shape of dog Igloo houses has a number of benefits. First, it offers maximum interior space for your dog as no corners waste any space. Second, no corners also means no points on which your dog might hurt him/herself when entering or exiting. The latter is very important for elder dogs and dogs with sight problems as they tend to bump on their housing a lot; with an Igloo house you don't have to worry about any bumps! The house's aerodynamic shape makes it stable against strong winds and make the interior noiseless so your furry friend can sleep soundly without the wind rushing in their ears. The design as well as well as the material of a dog Igloo house means that it remains cool in the summer and warm in the winter as soon as your dog steps into it. The plastic materials that make up the Igloo houses are extremely durable and resistant to wind, snow and rain while keeping warmth or coolness sealed inside. Also, the ventilation at the top of the house is fully adjustable so you can ensure your dog is as warm or as cool as you want them to be in their new house. Igloo houses typically come with a door flap that keeps out insects and other small animals while allowing your dog to scratch its back and feel safe inside. The house's extended entrance means that no rain or dirt will enter the house along with your dog. The house is rot-proof and cannot splinter as times goes by. There are no risks of swallowing odd pieces of housing (as is with wooden dog houses) and the whole igloo house is completely maintenance-free. Finally, thanks to its composite design and plastic materials the igloo house is extremely easy to clean and retains no odors or stains. As we've seen, igloo-shaped dog houses are both usable and cool for any dog and if you value your dog's health and well-being, you should consider one of these for your furry friend!